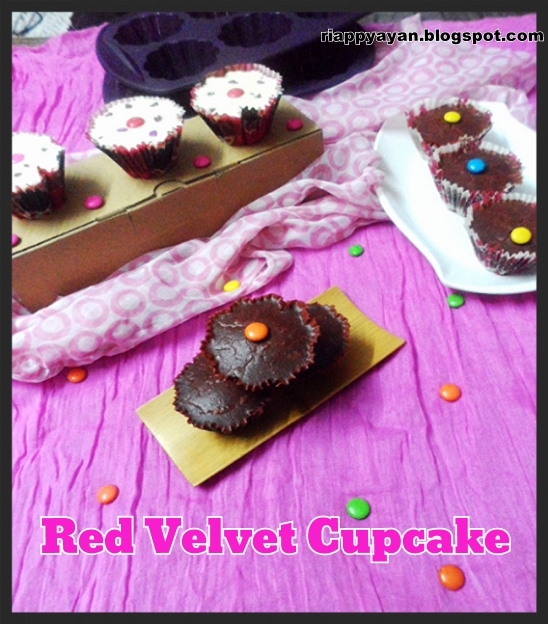 What are you baking for your valentine today?I have baked this cute red cupcakes for my sweethearts..
Red velvet cake/cupcake is classic American cooking with its roots in the south. Deliciously festive, moist, flavorful, red velvet cake is like yellow cake but with a little touch of chocolate. 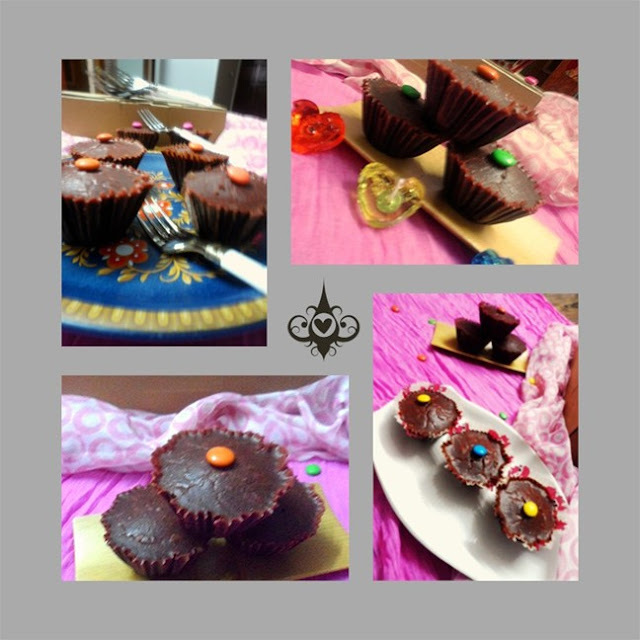 If followed the whole recipe correctly, you can get a very velvety, soft like a pillow textured cake within an hour. The red color can come from beets or even strawberries. But mostly add red food color dye for a better red hue. All red velvet cakes have specific ingredients in common: white vinegar, buttermilk and baking soda; the reaction of the vinegar to the buttermilk is said to better reveal the red in the cocoa powder. Do you know the history behind Red Velvet Cake : After doing a little research, I found that while foods were rationed during war time, bakers used boiled beets to enhance the color of their cakes and to retain moisture. Red velvet cake was a signature dessert at the Waldorf-Astoria Hotel during the 1920s, and was also well-known in the restaurants and bakeries of the Eaton’s department store chain in Canada during the 1940s and 1950s. Many attribute the cake’s recent popularity to the film Steel Magnolias, in which the groom’s cake was a red velvet cake in the shape of an armadillo. I tried this cake first time and followed the full recipe from Joy of Baking, but instead of adding red food color, I thought to add Beet puree for natural red color, as Beets are also in season. 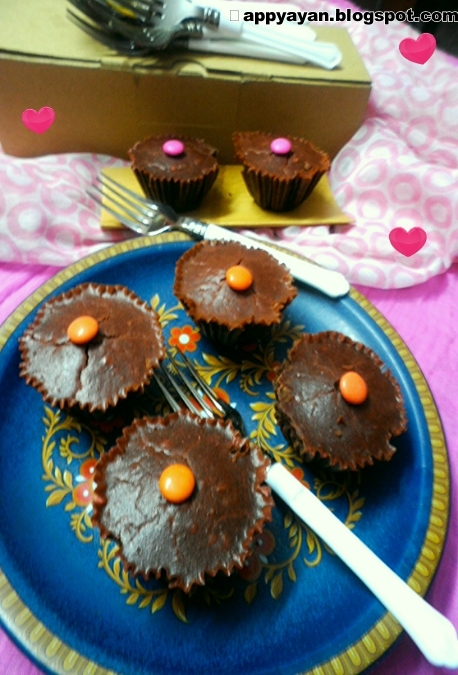 And I'm totally satisfied with the result and have no guilt of adding food color and very happy that I've served a healthy, delicious and pretty looking cupcakes to my family. This cupcake or cake is good any time of year, especially around Valentine’s Day. Dress them up with cream cheese or butter-cream frosting and with some pink and red sprinkles and share them with your sweetheart! Before you start, here is a useful tutorial about this recipe from "Joy of Baking, "
Red Velvet Cupcakes have a mild chocolate flavor that comes from adding just 1 tablespoon of unsweetened cocoa powder (regular or Dutch processed) to the cake batter. Although they say that the reaction between cocoa powder and baking soda gives a red tinge to the batter, to get the garishly red color of a Red Velvet Cake, we need to add lots of liquid red food dye (about 1 tablespoon). Buttermilk is responsible for this cake's moist and tender crumb. You can buy buttermilk or buttermilk powder, or you can make your own by adding 1 tablespoon of white distilled vinegar, cider vinegar, or lemon juice to 1 cup (240 ml) of milk. Just let this mixture stand 5 to 10 minutes before using. The cake batter uses the creaming method, that is, beat the butter with the sugar until creamy, add the egg and vanilla extract, and then alternately add the flour mixture and buttermilk (mixed with the liquid red food dye). The final step is to add a mixture of baking soda and vinegar. Because baking soda starts to react with the batter right away, try to get the cupcakes into the oven as quickly as possible"
Unsalted butter, at room temperature : 4-5 tblsp. Vanilla extract : 2 tblsp. Baking soda : 1/2 tsp.Baking powder :1 tblsp. Distilled white vinegar : 1/2 tsp. To get the best result, follow the recipe as it is step by step. Chop and boil the beetroots until done, Cool and puree into a creamy paste, adding very less water. In another bowl, beat the butter until soft (about 1-2 minutes). Add the sugar and beat until light and fluffy (about 2-3 minutes). Add the egg and beat until incorporated. Add the vanilla extract and beat until combine. In a measuring cup whisk the buttermilk and the beet root puree. With the mixer on low speed, alternately add the flour mixture and buttermilk to the butter mixture, in three additions, beginning and ending with the flour. Cool the cakes in their pans on a wire rack for 10 minutes and them remove from pan. Let cool completely before frosting. 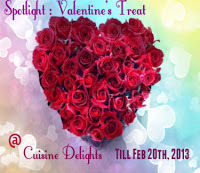 Sending this to my event, Spotlight : Valentine's Treat, co-hosted by Cuisine Delights. Happy valentine's day, love the way u used the beets to colour these cuties. 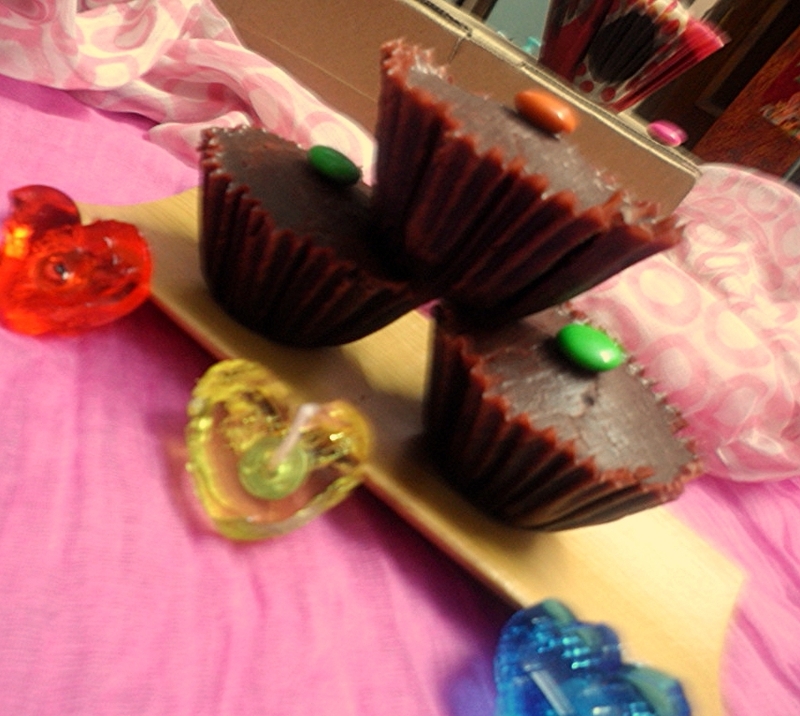 Nice and delicious cupcakes! Hope your husband loved them! !